Plumes of coal dust have become a part of everyday life in Visakhapatnam, the port city that handles a quarter of India's coking coal imports by major ports. Coal is manually unloaded from vessels and shovelled onto trucks that take it to an open stack yard from where winds carry coal dust to the city. But from October, a two-kilometre-long conveyor belt will transfer coal directly from vessels to rail wagons that will take the mineral to steel mills in Andhra Pradesh and other states. The Rs 600-crore mechanised coal handling facility is being built by Sterlite Industries, a Vedanta group company, under a public-private partnership (PPP) agreement signed with the Visakhapatnam Port Trust in October 2010. It will not only reduce coal-dust pollution in the city but also cut the turnaround time for vessels at the port. But the project is an exception in a sector where most ventures are running behind schedule. The government embarked on the PPP route for modernisation and expansion projects at major ports in the 1990s. India has 12 major ports, including in Paradip, Visakhapatnam, Chennai and Mumbai. These handled about three-fifths of India's cargo traffic in 2011/12. But they are choked to capacity and their market share has fallen from 74 per cent in 2003/04 to 61 per cent in 2011/12. The government aims to triple India's total port capacity to 3.1 billion tonnes by 2020. This requires investment of roughly Rs 3 trillion (one trillion equals one lakh crore), mostly by the private sector. "Modernisation of major ports is important as it will cut down the turnaround time for vessels once operations shift from manual to mechanised mode," says Ajeya Kallam, Chairman of the Visakhapatnam Port Trust, and President of the Indian Ports Association. The average turnaround time at most major ports is four to four-and-a-half days. In comparison, the world's best ports, such as Singapore, take no more than a day. Even in India, the turnaround time at private ports is about two days, Kallam says. So, why are port projects floundering? Interviews with port officials and company executives indicate it takes two years for construction to start due to the time-consuming process and the delay in approvals. No wonder then that only three of 22 PPP projects which were to be awarded in the financial year ended March 31, 2012, could be finally given out. This year's target is 29 projects, but there is little hope of that happening. "While there seems to be intent on the part of the government to push this sector, we still have to see action on the ground," says Nitin Arora, a research analyst at Angel Broking. "Our financial bid for an iron ore export terminal at Mormugao, submitted in May 2011, has yet to be opened," says Divyanshu Tambe, Manager, Corporate Strategy, Sterlite Industries. The delay has pushed up the project cost from Rs 1,000 crore estimated at the time. Sterlite is reviewing its decision to continue with the project, he adds. Mormugao Port Trust Chairman P. Mara Pandiyan says financial bids cannot be opened unless the Environment Ministry and the Cabinet Committee on Infrastructure clear the project. "For the past 18 months we have been pursuing with various authorities. The bidder (Sterlite) has already extended the validity of the bid three times, and if this does not get extended further we may have to re-do the whole project," he says. At Paradip, Sterlite is awaiting forest clearance to build a Rs 400 crore cargo berth. Construction was to begin in December 2010 but is now expected in March 2013 if it gets clearances by December this year. "We are pursuing the matter with the authorities and the forest clearance is in an advanced stage of process," says S. Anantha Chandra Bose, acting Chairman, Paradip Port Trust. Another project at Paradip has recently taken off, eight years after it was conceptualised. The project, to set up a coal berth with a capacity of 14 million metric tonnes a year, was awarded to Essar Ports in 2009. It got environmental clearance only this July and is likely to be commissioned in two years' time. "We don't bid for too many PPP projects. The bids are too high and don't make any commercial sense," says Essar Ports Managing Director and CEO Rajiv Agarwal. It's a similar story at the Jawaharlal Nehru Port Trust (JNPT) in Mumbai. It was here that the first PPP port project, to set up a container terminal, was undertaken in 1999. The port's three container terminals handled 56 per cent of India's container cargo in 2011. The fourth was awarded in September 2011 to a consortium of Singaporebased PSA International and India's ABG Ports. In January, the consortium refused to pay the Rs 50-crore stamp duty to register the concession agreement. The state government has yet to decide on the stamp duty issue, says S.N. Maharana, Chief Manager, Operations, JNPT. PSA did not respond to BT's emailed queries. To compound the problems, ABG in March sought to withdraw from the Rs 6,700-crore project. The Shipping Ministry is likely to take a call on ABG's withdrawal soon. There have been reports that JNPT could invite fresh bids, but Maharana did not wish to comment on the matter. 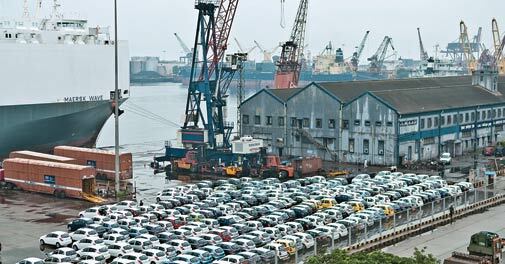 The situation is no better at Chennai port, a hub for car exports. Here, a mega container terminal is in the works. 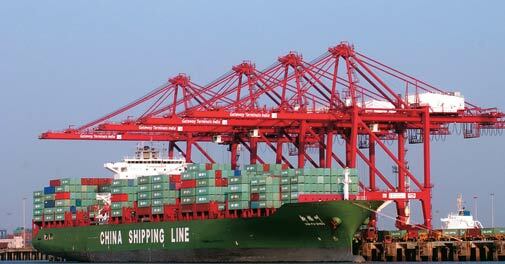 Senior port officials, who did not wish to be identified, say the Rs 3,666-crore project would boost container handling capacity to seven million twenty-foot equivalent units (TEUs) from two million TEUs. Essar Ports and Adani Ports have bid but are awaiting security clearance from the Home Ministry. "We should have awarded the contract in 2011/12 but the security clearance has not come. We hope to award the contract by the third quarter of this fiscal year," says a port official. Container cargo makes up 53 per cent of overall cargo the port handles and is growing at 24 per cent a year. The port's focus on container cargo comes after the Madras High Court, acting on a petition on pollution caused by dust of coal and iron ore, ordered it to stop handling the two minerals from October 2011. The ban led to a drop in cargo volume to 55.71 million tonnes in 2011/12 from a record 61.46 million tonnes the previous year when it handled 17 million tonnes of coal and iron ore. Port officials and industry executives say the port trusts should be given more powers. The trusts should be allowed to approve projects entailing investment of up to Rs 500 crore, compared with the current cap of Rs 50 crore. In fact, the government is already taking steps to expedite projects, says a shipping ministry official. In late September, for instance, the government enhanced the ministry's financial powers to clear PPP port projects entailing investment of up to Rs 500 crore from Rs 300 crore previously, the official said. In early August, the Centre eased the land transfer policy and did away with the need for Cabinet approval for some project categories. Pratik Agarwal, Director, Sterlite Ports, the holding company formed for the Vedanta group's port assets, says companies should conduct proper due diligence and risk-return analysis before bidding. "Projects should be bid out only after all major clearances, like those relating to environment, forests and security, are in place," he says. Kandla Port Trust Chairman P.D. Vaghela, however, thinks it may be unrealistic to expect major changes anytime soon. "Government procedures are bound to take time and one cannot have things overnight." What skills do you need to be an odour tester?